Similarity data for large color differences, obtained with triadic comparisons, are presented. Approximately 63,000 judgments are collected. 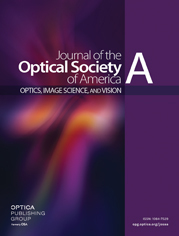 We have compared the performance of the CIELUV, the CIELAB, and the Optical Society of America’s ℒjg color spaces, using three different color sets and two instructions. For color sets containing large color differences in the isoluminant plane, the ℒjg color space outperforms the CIELUV and CIELAB spaces. We also investigated the effects of selective attention and conclude that, for judgments of large color differences, selective attention leads to significant changes in the relative contribution of the brightness dimension on the one hand and the hue and saturation dimensions on the other hand. a Three large values of wℒ are probably due to noise.